We read an editorial on Nov. 16th by Kim Knepper titled, “A Plan To Save Children” and we want to applaud her big heart and efforts to do something about the #1 killer of children under 14 – suicide. We need more people across the country brainstorming, like Kim Knepper, for solutions to bullying. Bullying is the largest cause of suicide and we need to get rid of this pandemic in our society. Now. -Privacy: The privacy of the students, parents, teachers, administrators, and privacy from the public are valid. For example, if a student is a bully-victim (has also been bullied, possibly at home), and let’s say, in third grade, she consistently pushes her victim. That video could harm everyone involved forever. It could be humiliating to the bully-child who doesn’t have the social skills training from home or is replicating abusive behavior done to her and she doesn’t stand a chance to change. The vulnerable victim who doesn’t have self-worth will continue to feel as if she is a person of no worth by adults, peers and the community. The public is very judgmental about the behavior of others and easily offended. Both the bully and the victim lose because change isn’t possible when someone is already judged by everyone around them. Adults, including the teacher may also be wrongly judged and the parents. It’s very complex. -Protection: family dynamics, peer culture and school factors have to be safe-guarded. Negative environments may lead bullies to have negative self–worth and expectations, and may therefore attack before they are attacked—bullying others gives them a sense of power and importance. If you spotlight them with a camera, the bully may react even more because we know negative attention is better than no attention for bullies. Meanwhile, victims stay vulnerable from constant evaluation and proof they aren’t worth anything on camera. -Perception: observations and opinions are going to widely vary depending on who sees the tape, how much is seen, when is it shown, why is it shown. Hidden agendas always pervert insight and truth). It happens in the media all the time. We feel the best solution is prevention. Being a victim is not a choice, but choosing to not stay a victim is a choice. So, even if someone is in the midst of being bullied, with guidance, they may choose to start moving away from being a victim and grieving their losses, and start learning how to identify themselves with our 5 C’s—Civility, Courage, Confidence, Creativity and strong Carriage— so they will be a good leader for themselves and eventually others. My daughter, Jessica (not her real name) and her friends (in the eighth grade) are constantly saying to each other, “I hate you” and then laughing. It’s not only that. They are supposed to be friends but the four of them are consistently rude, laughing, texting while they are with each other, talking about … really nothing, and they always make weird faces at each other for no reason. Jess and her friends mock everyone, ignore everyone, take bites of each other’s food without asking, use each other’s stuff without asking, they even go into our refrigerator and don’t ask if they can have something, but they just take it and eat it. Is there something mentally wrong with my daughter? Should I take her to a therapist? We doubt she has mental issues that need to be discussed with a therapist. However, it never hurts to have her assessed. It might help her to understand that she needs to respect your boundaries, to have common courtesy, and to have the manners you have taught her or she will incur consequences. Rudeness, insensitivity, disrespectfulness, carelessness, mean joking, criticizing, mocking, at anyone’s expense, especially the expense of those you love and those in authority, is a recipe for a failed society. Adults have accepted this crass “new normal,” too. Many adults are accepting reality shows, social media, TV shows, offensive pictures, behavior, and thoughts that demonstrate this abhorrent behavior as normal. Society must go back to the Golden Rule taught by previous generations: Do unto others as you would have them do to you. Call the girls into your home, sit them down, and make sure you have their undivided attention as you explain that you have boundaries about civility, love and care in your home. They may not abuse your rules. Write down your Top Ten. For instance, some rules you might begin to impose are: don’t take food without asking; don’t say the word “hate” in your home; pay attention to others in a thoughtful way. If every adult started being a good example, disrespect and incivility would be unacceptable among our young people. As my husband and I kneeled down to say a prayer at nighttime together, part of our normal routine, I suddenly started to sob. This wasn’t just a few tears trickling down my cheeks. It was a guttural bawl and something I haven’t experienced in a long while. Earlier in the day, I found out that a young girl in our community had committed suicide. 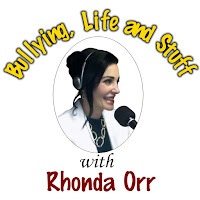 As the president and founder of our nonprofit foundation, Rhonda’s STOP BULLYING Foundation for Girls, I read, listen, speak, teach and write about suicide and other problems plaguing our young girls daily. My heart is not hardened to it, but it is so common that I don’t usually cry. This suicide hit too close to home. By the end of the day, I felt I had to be strong around all the other girls who knew her, some knowing her as a best friend. “Strong” is a powerful feeling when it’s genuine and firmly won. But when it’s a façade it’s the worst and most empty feeling of all, and to be told, as bullying and abuse victims often are, “be strong” doesn’t help. It’s said with every good intention. Friends and family don’t know what to say when their loved ones are hurting in every cell of their body. I cried that night because our foundation’s mission is to help girls with our Triangle of Triumph and take them through their journey from victim (or preventing victimhood) to survivor to becoming a confident, civil, courageous, creative leader who exudes elegant carriage. Going from victim to survivor to leader is a process, though. As a victim, girls need to grieve their losses…losses of friends, family, reputation, privacy, and truth. There are specific baby steps we teach our girls to help them not stay a victim. Girls then need to move to being a survivor. That’s where the real journey is. That’s where a girl learns to define herself before others do. Once a girl feels comfortable about herself and she can love others even when she’s not loved back … she is ready to stop being a people-pleaser and start being a faith-filled leader. My tears were for this girl, who we couldn’t help, couldn’t comfort, couldn’t teach, couldn’t help her find hope and couldn’t finish her life feeling her worth as a loved daughter of a loving Father in Heaven. We wish her, and all young girls who have gone too early, to rest in peace and love. May her family be comforted. May the bullies who have harmed her with weapons of words, if this is true, realize bullying is a crime and get help. Parents—suicide remains the leading cause of death of children under 14. Never, ever dismiss anyone who says they want to kill themselves. Listen, stay with them, and get professional help. If you have problems, if you’re a victim of bullying or abuse, please contact us at anytime at rhonda@rhondastopbullying.org or 928-515-9996. If you’d like us to address your problem in the newspaper, send us a letter. You don’t have to give your name.